Well, I am a firm believer that you should look after your own family, and I am a member of the awesome Ubuntu family, so I have managed to swing a sweet deal with O’Reilly, the publishers of the book, to send all approved USA based teams a free printed copy of the book and all other approved teams a free electronic copy of the book. While we wish we could send all approved teams across the world a free printed copy, O’Reilly are only able to cater to USA based teams right now. Damn economy. I will assess whether you will receive a print or electronic edition. 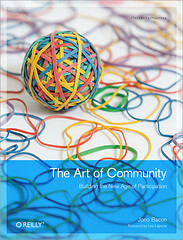 A few weeks after the deadline you should receive your edition of The Art of Community, for free! Only approved teams are eligible for the free copies of the book. O’Reilly will kindly cover postage, but not any import tax or other shipping fees. The deadline for getting your requests in Wed 2nd September 2009. That’s might be a cool book. Are you going to make it available in some other languages than English? Waiting for a copy in India.. Hopefully it arrives soon..
our team contact person Russell John is out of town and can’t get hold of him. a) will the electronic version of the book still be available after the deadline passes on September 2? b) is there any provision to get the electronic mail other than the contact person? any pointer/suggestion would be great.. hope to hear from you soon. (ps: if you think I should not have contacted you even after you specifically said none other than contact person should email you then sorry in advance, just let me know that its not appropriate, I won’t do it again).